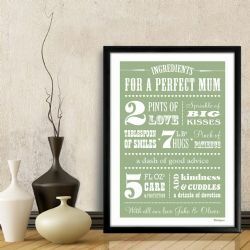 What ingredients make a Perfect Mum? 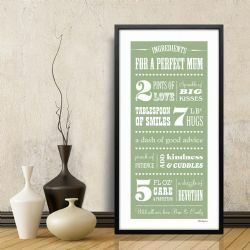 Tell your mum just how special she is with our gorgeous 'Perfect Mum' print - a great gift for Mother's Day, birthdays, Christmas or as a special gift to tell her how much she means. Made even more unique by adding your personalised message to the bottom of the print - it's sure to be a treasured gift for years to come.